The Legal Resources Centre (LRC) is a public interest law firm based in South Africa. It uses the law as an instrument of justice for the vulnerable and marginalised, including poor, homeless, and landless people and communities who suffer discrimination by reason of race, class, gender, disability or by reason of social, economic, and historical circumstances. The LRC seeks creative and effective solutions by using a range of strategies. These include impact litigation, law reform, participation in partnerships and development processes, education, and networking within South Africa, the African continent and at the international level. One focus of the LRC is providing legal support to communities. They specialise in impact litigation, choosing their cases carefully in the hope that the outcome will have an impact on a broader group of people than only the community in question. This can happen through setting of precedents or actual law reform. In South Africa and the other Southern African countries where they work, the statutory frameworks that protect community lands and natural resources (in particular land held under customary tenure) are weak. As a result, they attempt to use customary law as a source of law to counter these weak frameworks and provide better legal protections for communities’ land and resource rights. But there is a second important reason why they regard customary law as a useful tool for protecting community rights. Government or investor consultations with communities are often framed in terms that alienate communities. These consultations tend to pertain to complex environmental impact assessments, or assume and impose a single development paradigm (mining as the only road to community prosperity, for example). They also often follow the procedural rules of formal Western law (i.e. allowing 30 days for the entire consultation process). LRC asserts customary law as the legal framework for consultation procedures not only to raise the bar to require community consent, but to ensure decision making according to a community’s customs, and at a community’s pace and timing. The conversation, then, is not about legalistic impact studies, but about the community rules and actual impact. Hobeni houses in the Dwesa-Cwebe Reserve on the Transkei coast of South Africa. The existence of a clearly identifiable, easily defined ‘community’ is almost always a fallacy. Rather – and ideally – a community self-constitutes and organises in relation to its past and its desired future. In defining itself in this way, a community sometimes (a) builds on its history and living customary law and (b) develops out of engagement and struggle, inventing itself as a community different to its neighbour. This invention is a process. The community’s boundary is often fluid, depending on changes in the environment. In South Africa, the identities of ‘communities’ have become deeply contested. This is the case in many African countries that experienced colonial rule. More than a century of imposed and discriminatory statutory regulation by British authorities transformed communities in South Africa from fluid groups bound together through kinship, indigenous governance systems and relationships of reciprocity, to geographically and socio-politically fixed and bounded units based on statutory definition and, more often than not, centred around an all-powerful traditional leader. As a result, community identities often became artificial and as a result, lacked legitimacy. This becomes a major problem when outside interests seek to acquire or control lands or natural resources belonging to that ‘community.’ In order to avoid intra-community contestations and time-consuming community engagement, investors and government tend to pick an individual or elite structure, such as the traditional leader or traditional council, to speak on behalf of ‘the community.’ This often results in elite capture, corrupt leadership and communities sinking ever deeper into poverty. These fixed forms of community identity with centralised, unaccountable and all-powerful leadership structures can be countered by smaller communities within the community challenging state imposed identities, definitions and representatives. They do this through organising and self-identifying in different ways, for example, around a common issue. The example of the communities of Dwesa-Cwebe is one such case. In the last three hundred years at least, seven communities descended from the royal lineage of the Xhosa lived on the East Coast of South Africa in the area today demarcated as the Dwesa-Cwebe Nature Reserve. The area is on the banks of the Mbashe River, close to where Nelson Mandela was born and raised. It was formally annexed by the British in August 1885. Soon after, Mfengu people came to settle on the Dwesa side of the Mbashe River. The exquisite beauty of the virgin forests surrounding the mouth of the Mbashe River quickly caught the attention of colonists. As early as 1893, British authorities began demarcating the Dwesa and Cwebe Forest Reserves on both banks of the river. Between 1898 and 1931, forced removals relocated all the local villages. However, the removals took five decades to be finalised because of resistance from the local villages. The areas that people were relocated had poor quality soil and lacked the necessary resources for cultivation, so communities kept returning and re-establishing themselves on their former land. These communities were relocated again in the early 1980s as a result of the so-called ‘betterment’ schemes of the apartheid government which again forcefully encouraged ‘villigisation.’ This is where most villages are still located today. From around 1995, the first democratic government of South Africa identified the Dwesa-Cwebe area as a flagship for its land restitution programme. The sense of euphoria and possibility that came with the promise of a new democratic era inspired this ambitious settlement proposal. It would not be slowed down by unnecessary complexity. The government created new representative structures within the community in order to facilitate the return of the land, despite the fact that various customary governance structures still existed within the community. The Restitution Commission decided to combine all seven villages removed over the previous decades to demarcate the Reserve and create a new community called the ‘Dwesa-Cwebe community.’ This new community was given legal personality and was represented by a Land Trust that in turn represented the seven villages. As part of this structure, each village created a separate communal property association. The creation of the ‘Dwesa-Cwebe community’ glossed over the fact that the only commonality amongst its members was the shared history of dispossession from the same area. The seven villages had previously existed separately and were spread out over a large area, made all the more vast by the inaccessibility of various parts of the ‘community’ by road. The villages have different histories of lineage, of settlement in the area and of dispossession. They also had markedly different histories of reaction to and interaction with the authorities – some exceedingly vigilant and even militant, while others had never produced a single protest. By the time the LRC encountered members of the Dwesa-Cwebe community in 2010, the national government had still not completed the land restitution they had promised. Instead the initial Land Trust structure had been replaced with successive structures and multiple court cases emerged as mistrust and allegations of mismanagement tore the community apart. On the ground, poverty and desperation had only increased. The LRC’s entry point into this community was on behalf of a small community within the larger Dwesa-Cwebe community: fishers from the village of Hobeni. They appealed to LRC for support when they were barred from accessing their traditional fishing grounds by the declaration of a no-take Marine Protected Area, facing arrest or worse for continuing to fish to support their families. In 2012, the LRC defended some of these fishers who had been criminally charged with attempting to fish in the Reserve. A concurrent application was launched in 2013 on behalf of the fishers of Hobeni and fishers from other Dwesa-Cwebe villages with the intention of forcing the government to address the complaints of these fishing communities. LRC’s approach to the case relied fundamentally on the customary law system of ‘the various fishing communities’ – which included their local governance systems for managing access to their traditional fishing grounds. Therefore, the case was framed entirely from a community perspective, leading community witnesses in court to recite their history, a local sangoma to explain the significance of the resource to the community’s culture and two expert social scientists to testify to the community’s historical governance of the resource. 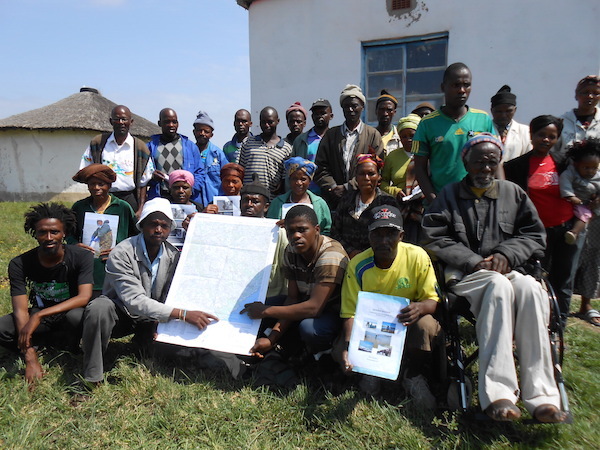 Given that the defence in the criminal matter was based on the fishers’ customary rights to the resources, the LRC had to develop a deeper understanding of the custom of the fishers as a community, the broader village as a ‘community’ and, ultimately, of the custom of the Xhosa people of the area. This entailed multiple focus group meetings with the men, women and elders of Hobeni – sometimes in one group, sometimes separately – to discuss the customs of the community. LRC staff sat down with the fishers of Hobeni for the first time on 20 January 2012. None of the houses in Hobeni had electricity, despite power lines running through the village to service the one tourist hotel inside the Reserve. LRC lawyers had to drive their car up to the window of the meeting room and charge their laptops on the car battery. Starting with a list of questions about the history of the community and fishing practices, the elders took turns recounting their childhood days when they learned not only to fish but to fish within the system of that community. Under this management system, rocks had names and belonged to families. Fishing was done by the men and the harvesting of mussels by the women. Access to the sea was regulated by knowledge of the resource and how to utilize it: people only went to sea if they understood the ocean. Above all, no-one would catch more than what they could carry. The sea was also about a lot more than fish and mussels, the elders explained. It was an integral part of their culture and religion: the ancestors live in the sea within the Reserve and must be honored there. Twins must perform specific rituals in the ocean. Traditional healers must go to the sea in order to become fully qualified. The sea water made the women fertile. At first, only a few fishers – all men – had the courage to speak. But as the onlookers observed the LRC’s enthusiasm at hearing the details of their history, their customs relating to the sea and the internal rules of the community, more and more community members, including the women, joined in. They sensed that this was their moment. The lawyers never struggled to fill a room with people whenever they returned to seek more information. You are using the wrong words. We didn’t have a ‘right’ to fish. Fishing was simply life. What you call ‘rights,’ for us was simply a part of life. It is you who use this language of rights. We don’t know that. We want our life, but if we can’t have that, then maybe at a minimum we can have these rights to fish that you are talking about. Similarly, at another meeting some months later, the LRC pushed the fishers for an explanation of community sanctions when community rules are broken. The purpose was to demonstrate the existence of a governance system and the logic of sanction was integral to it. Every time lawyers asked what would happen if someone broke a rule, for example, by catching more fish than he could carry, the fishers responded by saying that that would not happen. Again they would ask, “Ok, but let us pretend that someone had broken a rule. What would happen to that person?” “It wouldn’t happen”, they responded. It was not even possible for them to imagine. This growing confidence of the Hobeni community inevitably meant that the fishers from the neighbouring villages, also part of the greater Dwesa-Cwebe community, took notice and wanted to partake. Multiple ‘communities’ emerged: fishers from neighbouring villages arrived at the court house in support of their Hobeni brothers and united in song. The relationship between the marine resource and the land meant that the land structures became part of the conversation and the community used the struggle around fishing rights to further the greater community’s land rights. As well, the success of the ‘sub-community’ of Hobeni fishers had ripple effects throughout the larger communities of the Dwesa-Cwebe villages. The Land Trust structure created by the government to represent ‘the community’ became less powerful as community members realised that they could define themselves outside of these ‘official’ structures. It was back to the drawing board for the imposed structure and leaders now faced renewed expectations from their constituencies to be transparent and accountable. The divisions and tensions that inevitably exist within communities are often used by opponents to further weaken the community position. In the case of the Hobeni fishers and the larger Dwesa-Cwebe villages, litigation provided an opportunity to build community identity and unity. The court case created an opportunity for individuals and sub-communities of resource users to come together to elaborate on the narrative of their history and culture. By working together on a common issue and revitalizing their shared history and customs, the Hobeni fishers and larger Dwesa-Cwebe villages rediscovered and strengthened their sense of community, identity and pride. This process was a means for them to become a clearer and more unified ‘community’ such that they could be recognized by the law and the government. This strategy was successful: the renewed sense of cohesion amongst the fishers significantly strengthened their bargaining position with government. However, litigation can at times also create new divisions and tensions. In a community as complex and divided as Dwesa-Cwebe, this was a real risk. The LRC attempted to mitigate this challenge – and continue to do so – through ensuring absolute transparency. Before calling a meeting, the LRC would notify every possible party within the greater community– even those structures whose legitimacy or intentions were doubted. Minutes of meetings were recorded, typed and distributed across the villages. In addition, the LRC tried to dissociate itself from any factions within and beyond the community boundaries – some even involving other NGOs. This strategy was specific to this community; in many other cases where traditional leadership structures undermine community agency, the LRC intentionally sidesteps the leadership and even represents community members against those structures. But the LRC felt that the dynamic in Dwesa-Cwebe required a different approach. The contestation between different structures had more to do with frustration and incoherence than real power grabbing. It was worthwhile engaging everyone in the community as far as reasonably possible. Lawyers are often forced to ‘strategically essentialise’ communities for the purposes of litigation. That means that lawyers must speak about ‘the community’ as an entity with a single view all the while knowing that that is not the case. This can only be done once the idealistic notions of ‘community’ as unproblematic and reified entities are discarded; that is, if lawyers learn to live with and learn from the tensions. As lawyers working with claims based on custom, culture and history, the LRC have become used to coping with the tension between the language of law and the language of ‘facts.’ Anthropologists, historians and sociologists also try and understand the history and customs of communities. But in these sciences, researchers are encouraged to avoid essentialism and reductionism and instead unveil the complexity of communities and cultures. But a court is rarely interested in hearing about concepts that are too complex to define. Courts want to work with clear principles. The job of a lawyer representing communities, then, is to make sure that principles are infused with meaning that would benefit the poor and vulnerable – rather than the rich and powerful. The job, as lawyers, is to unashamedly inject meaning into these legal concepts before the more powerful forces do so – and re-appropriate those terms already conquered. It is important to remember that communities are dynamic, fluid structures. A community self-constitutes and organises in relation to its past and its desired future. In defining itself it builds on its history and living customary law and develops out of engagement and struggle, and invents itself as a community different to its neighbour. This invention is a process and the community boundary is often fluid depending on changes in the environment. Significantly, this self-constitution should not be dictated by a few elite interests, but ideally emerges from intra-community interaction. The local community so constituted may emphasise a particular aspect of its identity depending on the nature of the political, organisational or legal engagement, as how the Hobeni community organised around their right to their fishing grounds. The community then gives itself a political and organisational definition and presents its representative structures for the purposes of the particular engagement based on its own experience and strengths. Finally, community strengths often depend on how diverse interests of different interest groups join forces. Every community, no matter how small, carries with it the tensions of inherent heterogeneity, asymmetry and diverse interests. Within a community where these divisive factors are countered by the pull of commonality and cohesion based on history, on dynamic interaction or simply on familiarity, it can provide creative tension and a richness that strengthens the community. But within the constructed realm of a community created on paper, the differences often only result in undermining of the whole. This was the story of the Dwesa-Cwebe villagers. A critical role for advocates and practitioners is to support the self-definition and emergence of legitimate communities, including the healing and self-rediscovery of communities fragmented by outside interference.